In spite of individual differences, kindness is something everyone has to give. Taking a moment to do something nice for someone else can make your day, and theirs, more pleasant. Paying it forward is about sharing a positive moment with another person solely for the sake of making that person smile. The Pay It Forward Foundation encourages everyone to participate in "acts of kindness among strangers (to) foster a more caring society." The possibilities for spreading kindness one person at a time are endless. Every person of any age, ethnicity, or gender can find ways to share positivity with others. Showing good will and courtesy toward others can be simple, and it doesn't cost anything. Take a moment when you are out in public to make a friendly gesture toward at least one stranger. You never know what others are dealing with at any given moment; your kindness could change their whole day or even their outlook on life. Leave extra coupons near items on shelves in the grocery store. Surprising someone else with monetary savings could help that person afford more than usual. Help your neighbors with yard work. Next time you are mowing the lawn or weeding, take a few extra minutes and help your neighbor with his yard as well. Share your garden. If you have a home garden, consider leaving extra produce by the road with a 'Free' sign or delivering baskets to your neighbors. Clean up a public place. The local park, library children's area, or even doctor's office waiting room is shared space that might not get as much attention as needed. While you are there, take a few minutes to throw away trash or organize toys and magazines. Write a positive review for a local business. Head to your favorite restaurant or hairdresser's social media accounts and leave a glowing review. Let someone ahead of you in line. Whether inside a business or outside in heavy traffic, give the person behind you a break by letting him get in front of you. You may only be saving him five minutes or less, but sometimes that can make a big difference for those in a rush. Fill up shared supplies when they get low. In an office or a public restroom, one easy way to make life simpler for the next person is to refill the supplies like a toilet paper roll, copy paper, or brewing a fresh pot of coffee. Leave encouraging notes in random places. 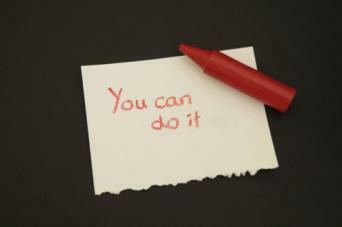 Using whatever paper you have on hand, write notes of encouragement using inspirational quotes or phrases like, "You look great today!" When you head out in public to the store, bank, or similar location place notes in plain view. Compliment a stranger. If a woman walks by with the greatest boots you've ever seen, take a second to stop and tell her. Compliments are a serious mood booster. Write an email to someone who made a difference in your life. People often think wonderful things about others and then never say those things out loud. Think of a family member, friend, or teacher who changed your life and send her a note saying so. Offer a ride to someone you know who is walking, especially in inclement weather. Even if the person declines, the gesture will be appreciated. Offer your seat to someone who needs it more than you. Whether in a waiting room or on the bus, giving up your seat shows true concern for others. Take pictures for tourists. If you see a group trying to get a photo together, offer to take it for them. People want to feel comfortable and secure in the place they choose to live. Showing kindness to your neighbors and local acquaintances can help create a happy community. 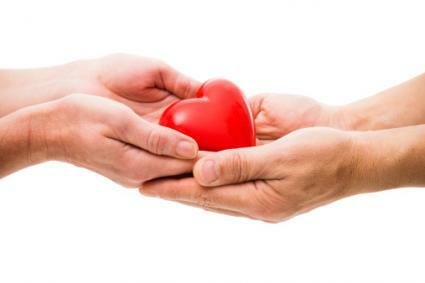 Find a blood drive near you and donate blood to help people in need. In lieu of gifts for your birthday or another holiday, ask guests to donate to your favorite charity in your name. Donate goods to local nonprofit organizations like the library, pet rescue, preschool, thrift shop or soup kitchen. Volunteer in your community. Stop by a local organization and ask what types of jobs you could volunteer for. Sign up for a charity walk/run. By participating in fundraising events within your community, you keep those programs alive for your friends and neighbors. While acts of kindness can be free and simple, sometimes going a step further can make a bigger impact. If you can afford to, focusing your efforts on larger groups of people can help more than one person at a time. Pay for the person behind you in line. From coffee shops to a fast food drive-through, offer to pay for the person after you by leaving money with the cashier and explaining your intentions. Leave a toy in a shopping cart. Many parents shop with young children, which can be challenging and stressful. Make someone's trip a little easier by purchasing a new toy and leaving it in your shopping cart with a brief note saying, "Please accept this gift for your child to make this trip easier for you both." Collect your change in a jar over time. 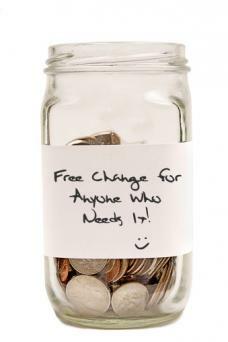 Once the jar is full, offer to leave it at a register in the store with a sign saying "Free change for anyone who needs it!" Take care of the environment so future generations of strangers can enjoy it. Follow the three R's: reduce, reuse, recycle in your daily life as much as possible. If you are in a great position financially, sharing your wealth with others is an easy way to extend kindness. Even if you are not wealthy, choosing one bigger project each year can help you feel like you are making a bigger difference in the lives of others. Pay for someone else's meal when you are out to eat. Choose a table of diners that came in after you were seated, talk to your server about paying the bill, and pay anonymously before you leave. Create blessing bags for the homeless and leave them in a local shelter. Blessing bags, or bags of hope, typically contain non-perishable food items, personal hygiene products, clothing and change. Make and deliver a basket full of sunshine to someone going through a tough time. Gather items that are yellow and feature suns or smiley faces like specialty desserts or candies, a fun journal, or a t-shirt, and organize them in a basket. Give the basket to someone in need of a brighter day like a recently widowed friend or someone who just lost her job. Be generous with gratuities. Any place you typically tip the person serving you is fair game. Simply leave a tip that is two, three, or four times the size you normally leave. Use your amazing talents and free time to participate in a project. Larger projects like these can be tackled on almost any budget and typically require just a little more time. 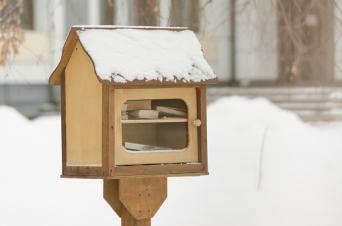 Build a little free library. Using scrap wood and books you no longer read, create a spot in front of your home where people can freely take or leave books. Bring a meal, snacks, dessert, or beverages to people working as public servants like volunteer firefighters. Call ahead to ask about a good time to deliver the food and how many people to plan for. Send care packages to friends and family living far away from you or to military personnel. Plan a surprise party for a friend's accomplishment. Look for little reasons to celebrate like a promotion at work or winning an award and put together a party to celebrate. One person can make a difference by brightening up another person's day. Paying it forward is a simple initiative anyone can participate in, anywhere and at any time.